Devon is a gymnastics prodigy and Olympic hopeful. For her parents, there are no limits to how far they'll go to help her achieve that dream--until a violent death rocks their close-knit gymnastics community and everything they have worked so hard for is suddenly at risk. 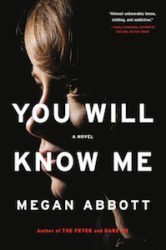 One of the most radical and satisfying elements of Megan Abbott’s brilliant eighth novel, You Will Know Me is that it calls all such unexamined assumptions [of the genre] into question ... Beneath the glittering carapace of Abbott’s lush, skillful, subtle writing, it’s impossible to know what we’re supposed to think. One of the strengths of this novel is that it doesn’t mind what we believe ... All of this Abbott pulls off with breathtaking skill. ...a masterful tale that’s both suspenseful and an eerily accurate portrait of the way teenage and parental cliques operate ... Throughout the novel, Abbott shrewdly dissects the cliques within cliques swirling within BelStars gym but never lets the suspense flag. In hijacking young-adult fiction for her own devious grown-up purposes, [Abbott] writes from such a chilly remove you may want to turn up the thermostat. But the underlying tension she sustains is so beautifully unbearable, you may be unable to leave the couch ... [an] un-put-downable new novel ... Abbott is a literary descendant of Richard Yates, John Cheever and other writers who captured what used to be called lives of quiet desperation. What did you think of You Will Know Me?